To check the flow capacity (Kh) calculated from log analysis, it is sometimes helpful to calculate the flow capacity from an open hole drill stem test or a cased hole perforation or production test. Comparison can only be done for non-fractured and un-stimulated reservoirs because the open hole logs see the reservoir before fracturing or acidizing has taken place. 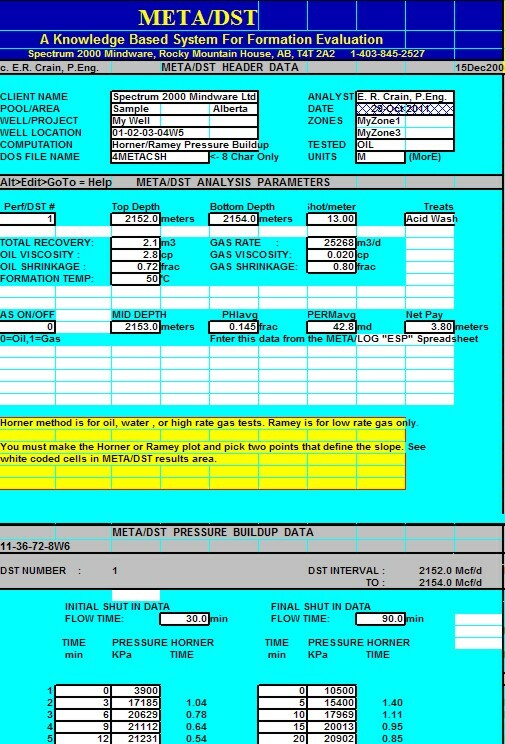 If you believe that stimulation offers a constant increase in well productivity, then the log analysis permeability parameters can be adjusted to reflect this. The Horner method is used for oil, water, or high pressure gas production. The Ramey method is used for low pressure gas wells. A spreadsheet called META/DST is available on the Downloads tab at www.spec2000.net that makes the work relatively painless. The mathematical solutions on this page were derived from Hugh W. Reid's DST Analysis course notes. Hugh presented his courses for many years in every oil capital on the planet. He specialized in finding by-passed pay, in spite of tests that were too short, or leaked, or which contained inaccurate pressure gauges. Unfortunately, that skill is not embedded in the math as it takes years of experience to recognize the knowledge hidden in poor quality data. 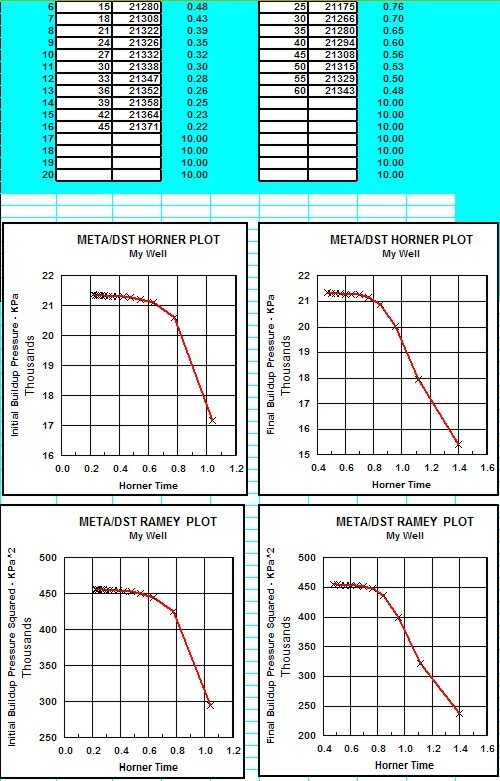 To some degree, the Horner and Ramey Plot methods shown here have been replaced by pressure transient software that relies on curve fitting or curve matching models, but if you have older analog records of a valid test, Hugh's methods will work well as a first estimate of flow capacity. Sadkt, Hugh passed away in March 2018 - his cheerful presence will be missed by many. The Horner plot is a crossplot of buildup (or drawdown) pressure (Pi) on the Y axis versus a dimensionless time coefficient (HTi), usually called Horner Time, on a logarithmic X axis. A typical Horner plot is given below.. 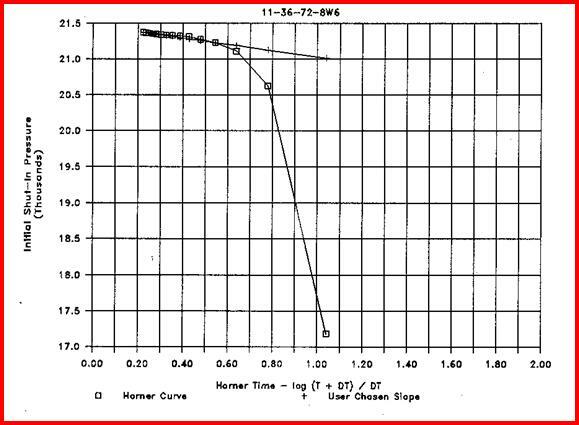 Plot graph of Horner Time vs Shut-in Pressure as shown below. NOTE: This can be done for each buildup or drawdown period. Qo is in bbl/day or m3/day; Qg is in mcf/day or m3/day. Pressure buildups on Repeat Formation Tester (RFT) can also be analyzed with this method. NOTE: AOFo is in bbl/day or m3/day; AOFg is in mcf/day or m3/day. The Ramey plot is a crossplot of buildup (or drawdown) pressure squared (Pi^2) on the Y axis versus a dimensionless Horner Time, on a logarithmic X axis. The analysis arithmetic for SIP and Dratio are identical to that for the Horner method, except that pressure squared is substituted where ever pressure occurs in the equations. Also, the KHoil and AOFoil equations are not used. A typical Ramey plot is given below. NOTE: AOFg is in mcf/day or m3/day. · Use only for stabilized buildup. · Use to calibrate logs only if zone is not fractured, has not been stimulated, and exceeds 160 acres in size. · The Horner method is used for oil, water, or high pressure gas production. 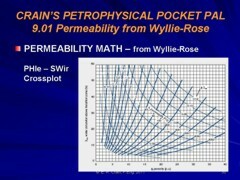 · The Ramey method is used for low pressure gas wells. 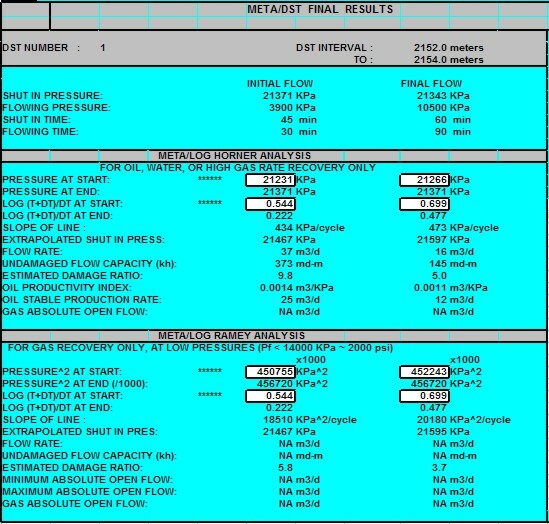 · The flow capacity calculated from the equations shown above is for the damaged condition of the reservoir. The AOF result has the damage effect removed. · To compare Kh from logs with Kh from DST, the Kh from DST should be corrected for damage by the same factor as used in the AOF equation. · Results may not compare to log analysis for many reasons, such as insufficient build up time, reservoir boundaries, vertical barriers, fractures, and reservoir in-homogeneity. In addition, the log analysis flow capacity must be summed over the same interval as drained by the DST. DST quality control is crucial. The Horner and Ramey methods only apply to valid tests which exhibit no boundary effects. DO NOT attempt Horner or Ramey analysis on an inappropriate DST curve. This spreadsheet plots Pressure Buildup curves using "Quick Look" Horner and Ramey methods. Pressure Buildup Analysis, includes "Quick Look" Horner and Ramey methods. English and Metric Units.